New in 2010, we were pleased to offer our clients in London, Kent, Surrey and the South East the largest chocolate fountain in the world, exclusive to us. Now 7 years on, it is still as popular as ever and is enjoyed at many weddings, special functions, parties and celebrity events. The World’s largest chocolate fountain was a new addition to the other wonderful equipment that we supply for hire here at Kelly’s Occasions. This would include many different sized chocolate fountains, hot dog stands, popcorn machines and slush puppy makers. With white, milk and dark Belgian chocolate on offer, the world’s largest chocolate fountain has delighted the most hard to please since early last year and continues to impress every host and every guest that has experienced it. The fountain is not only of an impressive size, but it is truly suited to any size party or function and makes a perfect centrepiece if you choose to hire it on its own. It stands on an Illuminated Light-box surround with a custom-made mirrored base, which looks very effective especially when the lights are low. We will supply the fountain alongside uniformed staff who are experienced in ensuring it is set up properly, safely and operates efficiently. They will make sure that there is plenty of chocolate and dipping items for you to enjoy throughout the day or night. Because we are so proud of offering for hire the World’s Largest Chocolate Fountain, we are delighted to take enquiries no matter how far in advance of your wedding, business event or party is. We just ask you to pay a £50 non-returnable deposit with the balance to be paid 2 weeks before your event. Standing an astounding 8 and a half feet tall and holding 40kg chocolate, it does not get any better than this. If you thought our regular large fountains were impressive, wait until you and your guests see this one, it truly is spectacular. This chocolate fountain can cater for up to 1500 people, but is also available to hire for smaller parties for the serious WOW factor. It is ideal for corporate events, celebrity and marketing events, promotions, large wedding venues, school reunions and many other functions. We are one of the leading and longest-running chocolate fountain suppliers in Essex and London, with years of knowledge and experience, so you can be happy knowing that we will make your event a memorable one. You will not get this fountain with specially constructed base and light-box anywhere else; we are the only chocolate fountain company in the UK to offer this package. With oozing chocolate that slowly dribbles down the fountain and collects like beautiful velvet, there is absolutely no reason not to enquire. We have 10 different flavoured chocolates for you to choose from along with 20 dipping items of your choice all freshly prepared at the venue. The largest fountain in the world may be large, but we ensure all our clients receive true value for money.  Offer your guests one of the most delightful chocolate experiences ever and speak to our expert team today about hiring the World’s Largest Chocolate Fountain – exclusively at Kelly’s Occasions. Our chocolate fountain looks truly stunning when stood tall, adorned with its flowing Belgian chocolate. You may have seen it yourself when it was recently featured on the BBC programme ‘ Marrying Mum & Dad’.